Each fall, dance teachers everywhere start scouring their music playlists and checking costume websites waiting for the new collections to be released. We start to think about what themes might suit our classes, if the tempo of the song we love will work well for the skills we’d like to showcase in the recital, and what songs our students will get excited about and love listening to all year long preparing for the recital. Stepping out of my 25+ years of experiencing dance recitals from every possible position, I started wondering what the dance recital experience looks like to a new-to-dance family. I imagine new dancers excited and maybe a bit nervous about stepping onto the big stage to showcase what they’ve learned all year long, and parents wondering during the preparation what they’ve gotten themselves in to. Participating in dance recital is really the culmination of everything we’ve learned all year long in dance classes – even though we won’t really focus on recital materials until much later, the administrative and organizational work for this June’s recital has been happening behind the scenes for months. Venue contracts are signed, themes are determined, dates are set – planning our three recitals truly feels on this end like planning 3 weddings on the same day! You’ll see the costumes and music selected for your dancer’s class(es) this week at the studio and on Facebook (if you don’t already, follow us here so you don’t miss out!). Here’s how we choose the costumes we select for each class – it’s an involved process! 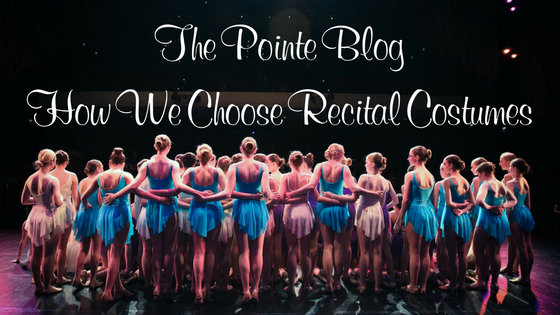 Instructors vary in their method of determining their recital routines – maybe they hear music on the radio and check the lyrics/content, then decide that catchy beat is perfect for their tap class. Maybe it’s hours of searching on Spotify or iTunes. Most teachers choose their music or theme before selecting their costume. At The Pointe, our music selection is grounded by our YPAD Certification – we check the lyrics (by reading them, not just listening and hoping we understand!) and make sure the messaging in the music is appropriate. There are dozens of dance costume companies that advertise to us – and as a studio with 80+ classes per week and a thriving competitive program, we purchase a LOT of costumes. We choose to support costume companies that have proven to have great quality, stick to their advertised production and shipping timelines, and offer a variety of costumes for all ages and themes. We strive to be great stewards of the costume money we are entrusted with by our families, and choose to support costume companies who produce age-appropriate and positive costumes for our kids. This year, a costume company became YPAD Certified – which is a huge step forward for our movement to keep kids happy, healthy, and safe in dance! We encouraged all of our instructors to order from this particular company whenever they had an option that matched their need and vision for the piece. We believe in voting with our dollars and supporting the companies who are doing the right thing and putting the integrity and health of dancers above the trends. We choose not to support costume companies who produce and advertise hypersexualized costumes for kids. Teachers work within a budget to ensure we can keep costumes as affordable as possible. First, we have a BLAST revealing costumes during Costume Week (this year, it’s October 24 – 30!). We post on Facebook, show all of the students and parents in classes, and play the song for recital. It is SO FUN to see a class get excited about their recital routine! Next, we measure – the first week of November when costume fees are due, teachers and assistants start measuring every dancer in class. Different costume companies have different sizing (just like how I sometimes wear 4 different sizes of jeans!) – so a dancer may be one size from costume company A and another size from costume company B in the same year. We usually measure about half of the class in each class to avoid losing too much instructional time, and the process takes about two weeks. After measuring, we organize our orders (so many spreadsheets!) by costume company, compare measurements for each student in each costume catalog, determine sizing, double check style numbers and colors, and get ready to order. We usually place our order the week of Thanksgiving – my Thanksgiving preparation includes costume ordering alongside cooking for our holiday meal! Costumes are ordered by Thanksgiving – and some will ship out in only a few weeks. Others that are manufactured overseas or made-to-order will take up to 5 months to come in. We know ordering costumes in November for a June recital sounds crazy – but we’ve learned the hard way that we need to take care of it in this time frame to have everything in hand before pictures. We also usually have some extra time in case a costume needs altered. What happens after they arrive? We work some mail-merge magic from our spreadsheets, print labels for every student and every costume, double and triple check that we got in everything that we ordered, label each costume, sort by class, and then distribute during classes. Your dancer will try on their costume in class to make sure everything fits OK before they take it home! When we start to get costumes in later this year, we’ll be sure to update the blog with our best tips for caring for and keeping costumes organized. Costuming three full recitals is a big undertaking – and we are fortunate to have amazing instructors choosing beautiful costumes and some gifted organizers in the office to make it all happen!